Bernanke needs 60 votes to end a filibuster of his nomination (known as cloture). After cloture, he then needs 51 to be reappointed. So, the bogey is 60 for cloture. 27 (19 democrats, 8 republicans). The bold names are those that voted for Bernanke in the Senate Finance committee. 16 in the committee voted “aye”. So, Bernanke picked up another 11 senators since the committee’s vote. 16 (4 democrats, 11 republicans, 1 independent). 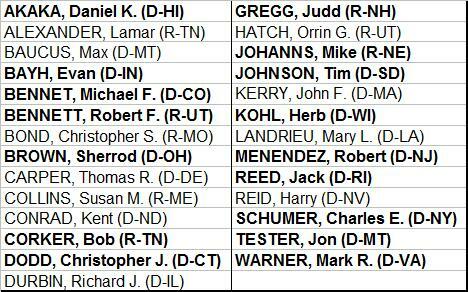 The bold names are those that voted against Bernanke in the Senate Finance committee. 7 in the committee voted “no”. So, Bernanke lost another 8 since senators since the December 17 committee vote. 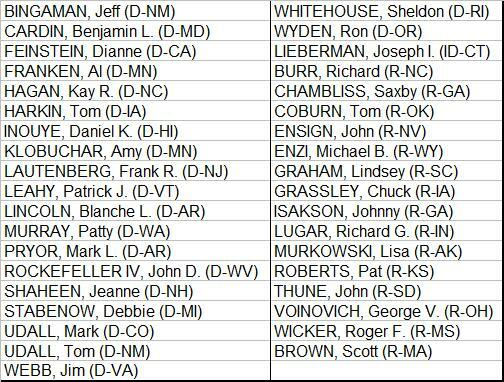 So far 41 Senators have publicly declared for or against Bernanke. 63% (27) are for and 16 (37%) are against. Remember he needs 60 of 100 votes, so this is very close. Additionally, since the December 17, 2009 Senate Finance committee vote, Bernanke has picked up an additional 11 votes and lost another 8 votes. Or, Bernanke picked up 58% of declared Senators and lost 42% since he passed the Senate Finance committee. Again, very close to the 60 of 100 he needs. 20 (13 Democrats, 7 Republicans) have publicly said they are undecided about Bernanke. No one on the Senate Finance Committee is undecided. But, we can be fairly sure many of these Senators have serious reservation about Bernanke despite Obama’s endorsement and winning approval from the Senate Finance Committee. Expect a majority, if not a solid majority, of these undecided Senators to vote “no” unless something happens in the next few days to change the political dynamic (such as a stock market crash as discussed below). Above we identified the position of 63 Senators on Bernanke (for, against or publicly stated they are undecided). That leaves 37 that have said nothing about Bernanke. 21 are democrats, 15 are republicans and 1 independent. Given how this issue was moved front and center on Friday, expect a lot of these Senators to publicly take a position in the next 72 hours. Bernanke’s reappointment vote is coming down to the wire, it is going to be close. Recall that Bernanke was reappointed in August by Obama and the Senate Finance committee approved him on December 17. Now with seven days until his term expires, his nomination has gone from a sure thing to in doubt. In other words, senators up for reelection are saying “aye” at a rate of 47%, not enough to get Bernanke reappointed let alone achieve 60% for cloture. Party affiliation does not matter. Thank the MA senate election and the desire of Senators to not support something that is unpopular. Is Bernanke unpopular? The following is from a CNBC survey taken in December. Bernanke was about as popular as Bernie Madoff. Do you want to say yes to a guy this unpopular if you’re in a tight reelection race? In the last 18 months, the threat or an actual stock market crash seems to force Congress to do unpopular things. In September 2008, after TARP failed to pass its first vote, the stock market crashed 777 DJIA points that day. All that week everyone from Warren Buffett on down hyperventilated that failure to pass TARP would mean destruction in the financial markets. A week later it passed. In January 2009 it was learned that Tim Geithner had a “tax problem.” Everyone from Warren Buffett on down hyperventilated that failure to approve Geithner would mean destruction for the financial markets. Geithner passed Senate confirmation even though six other Obama nominees withdrew because of similar tax problems (including former Senate majority leader Tom Daschle). Friday the stock market was down 220 DJIA points in part on fears that Bernanke might not get reappointed. We disagree with this analysis. We believe the market is down on fears the administration has no “plan B” if Bernanke goes down and it will take months for them to find a new Fed chief when the critical exit strategy needs to be formulated and implemented. 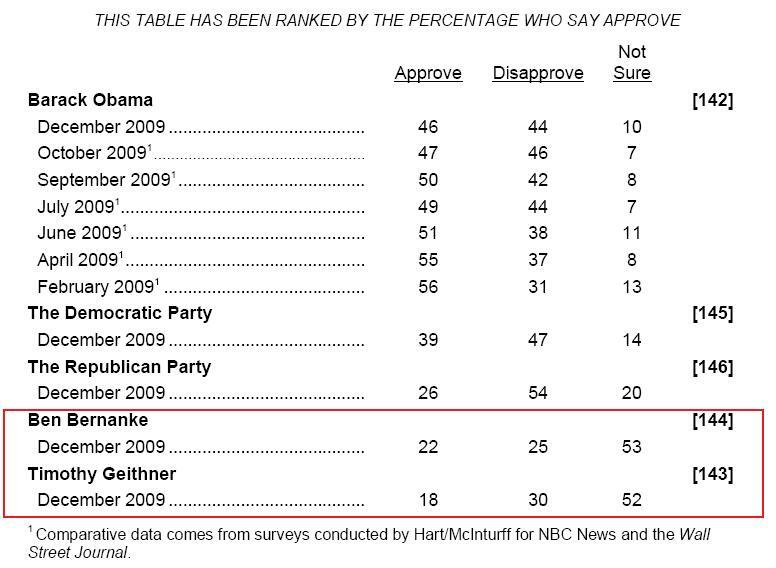 As noted above, Bernanke is not that popular so we do not believe it is about him. It’s about consistency and continuity. However, this might be a distinction without a difference. Again everyone from Warren Buffett on down is hyperventilating that failure to approve Bernanke would mean destruction for the financial markets. The question is if this threat and 220 DJIA point decline is enough to push Bernanke over the finish line. Or, do the markets have to get significantly worse this week to scare the Senate into approving Bernanke? Or guess is that Friday’s action is not enough as there are too many other cross currents between bank taxes, new banking rules (the “Volcker rule”) and the impact of the MA senate race to say last week’s decline was all about Bernanke. In other words, if Bernanke does not pass, the markets get worse as the next Fed chief is months away and cannot be as dovish as “helicopter Ben” and his two trillion balance sheet. If the markets do not get worse, Bernanke does not pass as the sense of urgency dissipates. Unless Friday was enough to scare the Senate to approve Bernanke, and we do not believe it was, it seems like the Bernanke situation is near-term bearish.